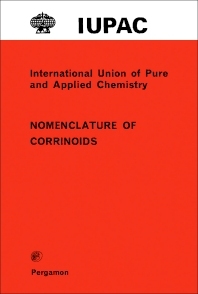 Nomenclature of Corrinoids deals with the nomenclature of corrinoids, which is defined as a group of compounds consisting of four reduced pyrrole rings joined into a macrocyclic ring by links between their α-positions. This book describes several important corrinoids that have a regular pattern of substituents on the methylene carbon atoms of the reduced pyrrole rings and a cobalt atom in the center of the macrocyclic ring. This text specifies the state of oxidation of the cobalt. This book explains as well that corrinoids containing metals other than cobalt are symbolized by placing the symbol of the replacing metal in square brackets preceding and attached to the symbol of the corrinoid. This book is a valuable resource for chemists, biologists, biochemists, physiologists, and research workers.